As a 21-inch 1600 x 1200-pixel monitor, the 321 sports a number of impressive features that will attract colour professionals, including a 10-bit colour table for displaying smooth gradients. The colour sub-menu allows for the individual adjustment of saturation over six colours - red, yellow, green, cyan, blue, and magenta - as well as offering the choice of six colour temperature presets. It also has a separate hardware colour calibration unit - which modifies the display hardware only - matching it to a white point gamma. The display features a telescopic base, although it only allows you adjust its height. DisplayMate showed its brightness levels to be 250 cd/sqm, which may seem low, but twinned with a 500:1 contrast ratio, this meant colours were nicely saturated and no grey separation occurred at all. The colour accuracy tests were exceptional. 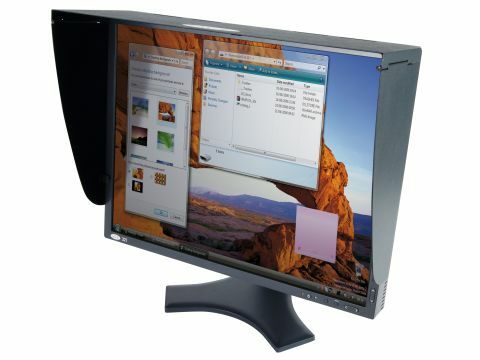 Two DVI inputs, for sharing the screen between a pair of high-end workstations, plus a D-sub are also present. Ultimately, the 321 is an expensive display with exceptional colour reproduction for graphics professionals.